I have sold pumps and pumping systems into the municipal and other market segments for almost 40 years. I now find myself replacing those old, outdated pumps and controls. I don’t consider that I am old and outdated, though. (No matter what some may think.) Everywhere we turn today, there are articles describing an industry roundtable finding, a publication noting deficiencies in our industry, or our government agencies asking questions. All are asking for, and looking for, “innovation” and sustainability. Before I go on, I want to recognize The Water Environment Foundation (WEF) who published an abstract regarding the “Municipal Wastewater Pump Station Design Problems and Solutions.” The study was written by Jeff Chapin, P.E., who has 32 years of experience in wastewater pumping design experience. What he covered, and what is still prevalent today is, in part, what I want to discuss here. Mr. Chapin defined twelve problems and solutions associated with pump station design issues. They are in his order: 1. Concrete Corrosion Protection, 2. Corrosion Resistant Materials, 3. Pump Protection from Influent Sewage Debris, 4. Pump Selection Based on Total Dynamic Head Calculations, 5. Energy-Efficient Operation, 6. Pump Station Appearance, 7. Surge Protection, 8. Rehabilitation of Existing Pump Stations, 9. Odor Control, 10. Prevention of Leakage into the Pump Station Structures, 11. Provisions for Future Expansion and 12. Grit Deposition in Wet Wells Sized for Future Flow Rates. The study addressed the problem of corrosion caused by hydrogen sulfide (H₂S) and the need for coatings and the maintenance or applying of plastic liners to wet wells; all adding costs from their uses. The report called out the serious degradation of all carbon steel and coated metal components, again due to the hydrogen sulfide corrosion. The solutions described the specified use of 316 stainless steel for all exposed components and fasteners as well as fiberglass grating and ladders; all adding greatly to additional costs. The study found that many wet wells needed basket screens, or other methods to handle and contain debris to protect the pumps. It also pointed out that the debris had to be manually removed, the wet well cleaned by hand often, to be effective. The recommended solution was to add an additional vault, 12’ in diameter, and comminutor and screens with grinders. It made note of the fact that the rakes and screens must be regularly cleaned by hand. Again, these solutions are at great additional costs. The total dynamic head (TDH) calculations for the typical wet well lift station can vary widely with pipe diameters, pipe materials, and length of runs. Some current system designs lend themselves to possible oversizing or even undersizing of the pump when pipe ages are considered. Solutions are to use actual field surveys and measurements, consider all gravity feeding possibilities, and to use much care to size the pumps properly. The exterior appearance of an existing lift station has little to do with the surrounding neighborhood. Typically placed in areas of newer homes or apartments that are “upscale,” exteriors need to match the surrounding architecture. 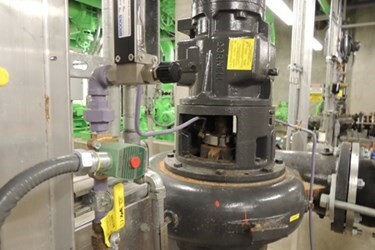 A problem stated is when the pumps cycle on or off or there is a power failure, high surge pressures can damage piping. The suggested solution is to install surge relief valves at each pump and use soft start/stop electrical equipment. The problem stated is cracks or joints in precast concrete manhole structures used to construct new pump stations that can result in groundwater leakage into the pump station which must be pumped to the treatment facility resulting in unnecessary costs and reduced capacity. WEF suggested using butyl caulking for a remedy. Another problem identified in the design criteria for submersible pump wet well sizing can lead to excessive grit deposition in the wet well due to initial low flow conditions. The grit can result in serious odor problems and is difficult to remove. The solution presented is to provide temporary solid concrete block filler in the wet well areas subject to grit deposition or provide baffle walls to reduce the wet well area during initial low flow conditions. In the future when the flows approach the design flow rate, the blocks or baffle walls can be removed. Pump Protection from Influent Sewage Debris is no longer a problem as the pumps automatically shred debris and are automatically self-cleaning; without human intervention. Energy-Efficient Operation is controlled as the system automatically adapts to the incoming flow, up to the limit of the total flow of the 2 motors, i.e., from 0 to 200 percent of the nominal flow. The performance of this system is between 2 and 4 times higher than the flow rate achieved by traditional duplex wet well pump down or pumping in a batch mode to surge at the treatment plant. Pump Station Appearance with this innovative system eliminates the wet well and it also eliminates the need for a separate vault for the valves. All valves are contained in the clean and dry former wet well reducing the footprint size. Electrical service can now be below ground for safety and/or appearance as well. Surge Protection in this innovative solution includes and uses a soft start ramp on start-up and a deceleration ramp before stopping each pumping unit to eliminate valve shock and water hammer. These soft starts and stops also eases stress on aged piping systems. Rehabilitation of Existing Pump Stations is unique as your current wet well can be converted to a clean, dry lift station without the expense of the corrosion resistant materials. Or as part of a new lift station installation project, the innovative system enables engineering and installations costs to be significantly reduced. Prevention of Leakage into the Pump Station Structures; while this is not a function of the pumping system to rectify, the innovative system has recognized this as an occasional issue. There is available a stainless steel package, drop-in, plug and play complete system. The in-ground stainless steel equipment room has a 25-year warranty against leakage. Provisions for Future Expansion; with this innovative system units can be supplied in variable flow from 0 to 400 percent and linking networks, etc. In the event of extensions being planned to the collection network, you can choose the corresponding model for the maximum future output with the knowledge that from the start, the system can operate constantly at the bottom of its range without excessive consumption. e.g. An innovative system with rated power of two 4 HP motors used at 30 percent of its operating range will actually consume 30 percent of the power of only one of its motors, i.e., 1.2 HP. Grit Deposition in Wet Wells Sized for Future Flow Rates. The innovative system in its design allows sand to be transported away in the flow and larger pieces of grit to be caught in the rear part of the body, or the “stone trap” designed for this purpose, where they can be easily removed via the service hatch. Now that you know there is an innovative and sustainable solution to these current and ongoing problems, you must be asking how you can get this system to reduce your costs and provide sustainability.